District Judge Barney McElholm was right when he complained he couldn’t hear a case on Monday because he was involved “in that other farrago, that travelling Eurovision Song Contest which has completely disrupted the criminal justice system in Northern Ireland”. He meant the G8 and its vastly overblown oppressive security arrangements. In the event he has been completely vindicated. Like the rest of the population here he’s having a good laugh at the prefabricated holding cells, the legions of police drafted in and judges on standby. For what? Anyone who believes David Cameron that he chose an island outside Enniskillen in an island called Ireland to stage the G8 had only to listen to PSNI chief superintendent Alan McCrum who said Enniskillen is really hard to get to. You have to come by plane or boat to Belfast or Dublin and then public transport, namely a bus. That made it very difficult for protesters. His comments must have really cheered Arlene Foster in her efforts to promote Fermanagh. 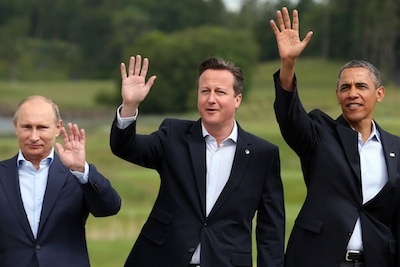 Of course David Cameron was effusively talking up the G8 meeting because it’s his only go at hosting it. However, this looks like being the least successful of all the gatherings and not just because the momentum has moved to the much more comprehensive G20 meetings, which include the rising Asian and Latin American powers. It’s because this one was dominated by Syria. a country where Barack Obama and his freshly shampooed poodle Cameron are isolated in their desire to meddle militarily despite all the experience of their disastrous, destructive interference elsewhere in the Middle East and Afghanistan, from where they are retreating, tail between their legs. Besides, relations between the US and its client Britain and the other six weren’t too warm after the Guardian revealed on Monday that the US and Britain had bugged the G20 meeting in London in 2009, listening into conversations between Russian president Dmitry Medvedev and his delegation (and the Turkish delegation too). It’s no wonder the Russians are staying in Sligo this time. Putin won’t be doing any texting from Enniskillen. In the absence of anything substantial emerging from less than two days together, the highlight for the forelock tuggers in the media and politics here (and aren’t they toe-curlingly embarrassing?) was Obama’s corny, choreographed speech at the Waterfront Hall where the headlines said he will “stand by Northern Ireland” and he would back those “who chose the path to peace”. Well, he would, wouldn’t he? He would hardly back those who chose the path to violence. He said: “The road to a lasting peace is as urgent now as it has ever been,” which is just nonsense on stilts. How can a road be ‘urgent’? No hecklers enquired how Obama would know anything about peace much less its urgent road. Sale audience of hand-picked respectful teenagers, you see. They didn’t know yesterday would have been different from other Tuesdays for Obama. We know that because in May last year The New York Times revealed that, on what White House aides call ‘Terror Tuesdays’, Obama selects the people to be killed by drones mainly in Pakistan, Yemen and Afghanistan. If you’re a ‘military-aged male’ in the target zone and get killed too you’re deemed a legitimate target. It gives a new meaning to the phrase ‘guilt by association’. The best critics of Obama’s appallingly repressive security state are Americans who know best the damage he’s doing to their constitution. Maureen Dowd, consistently cited among the best columnists in the US, recently ridiculed Obama for saying in 2007 he didn’t want to run an administration that was ‘Bush-Cheney lite’. Unlike Bush whose stupidity and ignorance are cited by some as excuses for his dreadful period in office, Obama was a liberal academic constitutional lawyer, so he knows what he’s doing. That’s why those he disappointed most are supporters who hoped he would restore some morality to America’s diplomacy. Fat chance.